A lot of video games are patterned after movies, with voice acting, cutscenes, and creative use of camera angles. The goal is to make players feel as if they are controlling the events of the scene they are watching, or even to imagine themselves as a character within the game’s world. One of the things I love about old video games is that the best of them accomplish this in creative ways, even in a very limited medium. One of the oldest games on my top 80 list is Air Fortress for the original Nintendo. The concept is simple, but it combines two different video game “genres” in a clever way and uses music to tell a suspenseful story. The first thing you’ll see in the video is the poorly translated story of the planet FARMEL, which was having the GLORIEST DAYS before it was attacked by these mysterious AIR FORTRESSES. In a plot development that gets used more often than you’d think in video games, the leaders decide that because this mission is so dangerous, the best course of action is to send one person to take on the fleet by himself. I love those cheesy stories for old video games– they can be hilarious! Needless to say, this game does its best storytelling without using words. There are eight levels in the game, one for each Air Fortress in the fleet. The video shows you level 1, and believe me– the makers of the game were being kind to the player in this level. Later levels get more difficult very quickly. I don’t remember if I even made it halfway through this game back when I used to rent it as a kid. 1. Approaching the Air Fortress by rocket sled. This part of the game is a side-scrolling shooter, like Gradius, Defender, and other classic arcade games. The screen scrolls by itself, and you have to pilot the sled to avoid the walls of the fortress and the enemies that fly around and try to shoot you down. If you collide with any of these things, your rocket sled is destroyed, and you only have three of them. It’s crucial at this stage to pick up the energy (E) and bomb (B) power-ups for you to use in the next section. 2. Inside the Air Fortress on foot. 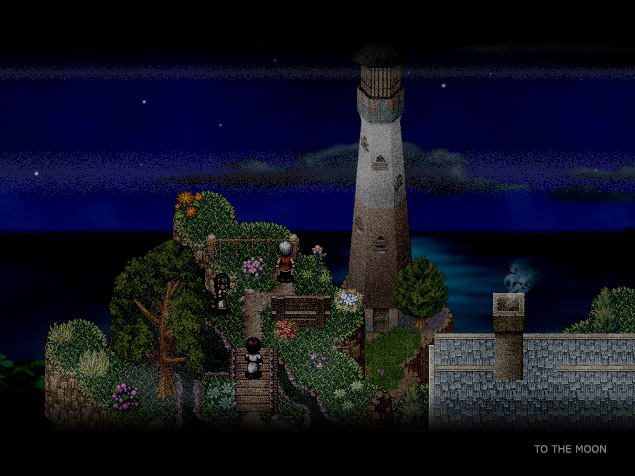 Here, the game turns into more of a standard platforming game, in which you can explore in any direction. The goal is to find the main power reactor of the Air Fortress and destroy it. I like the way the energy meter doubles as fuel for your rocket boots in this part of the game. This means that you have to be careful about how much you use the boots, because draining your energy puts you at more risk of being destroyed by an enemy. It also places a limit on the amount of flying you can do; if you run low on energy, you will need to stay on the ground for a while as your energy recharges. 3. The escape. This is where the game really draws you in to the story. When you destroy the main power reactor, the whole fortress goes dark and quiet, unsettling music begins to play. The Air Fortress is going to explode in a few minutes, and you need to find your rocket sled and escape before it does! In the first level, the game designers were feeling generous, so they put the exit right behind the reactor. But in most of the levels, you have to go searching for it. You might pass the exit on your way in to the reactor, or it might be in a part of the fortress you haven’t seen yet. The game doesn’t give you a timer, so you can’t know for sure how much time you have to find the exit. After a while, you start to hear a low rumble and the screen begins to shake. The shaking gets gradually more severe and the rumble grows louder until it almost drowns out the music. The screen begins to flash white just before the end until the entire screen is washed out, and — GAME OVER. The game is great at building tension, and it’s here that you reap the benefits of collecting (E) capsules during the rocket sled section– the more energy you have, the more you can use your rocket boots to hurry through the air fortress. Hello again! I decided to try out a different blog theme for this page. All of the content is the same still. What do you think? I like the colors in this one, but the old one had a less complex background and may have been easier to read. In general, people usually don’t like changes that aren’t necessary, but sometimes people on the autistic spectrum can be bothered by changes that others barely notice. A couple of months ago, I read a blog entry posted by a mother whose little girl is on the autistic spectrum. It was about a time she found her daughter struggling to hold back tears, telling herself “Sometimes things change, and that’s okay” in a method she had practiced to calm herself down. The cause for her distress was that the TV show she was watching had changed its opening sequence for a new season. She had been expecting the familiar opening that had been there every time, and something different was suddenly in its place. I found that post very moving, because I can remember going through some of the same things as a young child. One time, I was watching an episode of Sesame Street that somehow involved a marching band visiting the show. I can barely remember the episode itself, but I do remember that as the credits rolled, they had the marching band perform the theme instead of using the piano and harmonica recording that had appeared every other time. I was caught totally unprepared and burst into tears! On a half-conscious level, I was familiar with each note and time interval in the song, and not only was the band using totally different instruments to play it, but they weren’t hitting all of the notes exactly right! I just wanted to get away from it. I had a similar reaction if I was listening to a song and the record or tape speed got messed up and the sound got distorted. I always found it very disturbing to hear something familiar distorted into a grotesque form, with the essence of the original still there, just… twisted. I am thankful that, as I have grown up, I have become less sensitive to that sort of sensory input. I’m not entirely sure what has helped me besides experience, but I suspect that my love of science fiction may have helped me in this area. Science fiction often uses a distorted or unfamiliar point of view to show readers or viewers something about human nature. It can use a creature from another world as a mirror for ourselves, or it can show the consequences of our ideas by removing all limitations and showing what kind of future might result. I’ve come to appreciate how storytellers use the weird and unsettling at times to tell a story of great importance and beauty. Like anyone, I still worry about unwelcome changes in my life, of course. But I still have the same thing to cling to as I did when I was a child– God never changes, and he has promised me that I belong to him. Despite all the things in life that can scare or worry me, God is over them all, and he will not break his promises. Hmm– I think I’ll keep this background for a while. It seems to be helping me to start writing again.